4 titanium coated blades: Helps create a smooth shave. Titanium coated styling blade on the back: Helps create precise edges around sideburns, beards and under the nose. Lubricating strip with Aloe Vera and Jojoba: Provides a smooth razor glide and skin comfort. Large rubber fins: Help stretch out the skin and raise the hair before shaving. 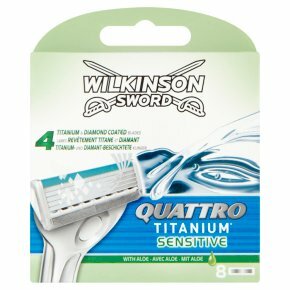 Fits with any other Wilkinson Sword Quattro men's razor & contains 8 blades.Looking for a close and comfortable shave? Quattro Titanium men's razor is what you need. Why is it a perfect fit? It's all down to the 4 ultra-sharp titanium coated blades combined with the enriched lubricating strip that deliver the results you are looking for. Got tricky areas that need shaving? No problem, the ultimate four blade razor has an edging blade to help you complete your look .